As Anglian sponsor NCFCs Man of the Match, we can bring you each home game report straight to the blog! Read on for details of the Man of the Match presentation for the NCFC vs. Sheffiled Wednesday game on 4th April. 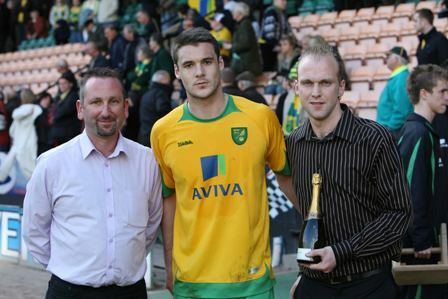 On-loan defender Jason Shackell picked up the Anglian Man of the Match award as City slipped to a narrow 1-0 defeat to Sheffield Wednesday last time out at Carrow Road. Seen here presenting Jason with his Man of the Match champagne are Kevin Warnes and Jonny Lamb, representatives of the Anglian Group. Speaking in the Gunn Club at the post-match presentations, Jason reflected on a frustrating afternoon for all concerned at Carrow Road. “We didn’t play well enough today – that performance was not even close to where we have been over the last few weeks,” was Jason’s initial reaction. After joining league leaders Wolverhampton Wanderers from Norwich at the start of this season, Jason was asked about how his game has changed over the time he’s been away from Carrow Road. The defeat by Wednesday left City just above the relegation zone going into the crucial Easter period and Jason confirmed that everyone at the Club – players, staff and fans must stick together for the final five games of the season as City battle to beat the drop.